Posted by randydeutsch in architect, architecture industry, BIM, books, change, identity, IPD, marginalization, survival, technology, the economy, transition. My first was the twelfth. That is, the twelfth edition of The Architect’s Handbook of Professional Practice. That was the last edition to be offered in four separate three ring binders. And crisp, with an off-center AIA logo super graphic emblazoned across the front. I read the entire contents cover to cover to cover to cover. Here, I thought, at last was the architect’s missing user’s manual. After 4 years of undergraduate schooling and 2 years of graduate school, I still didn’t completely understand all that an architect was and could become. And with the deep blue “backgrounders” ample history of what the architect once was. For the first time you sensed that you belonged to a long tradition. One that you were proud to be a part of. It would never again be so simple. Volume 2 was even simpler. Could it be laid out any more straightforward? The last two binders contained facsimiles of the AIA documents. Here was the be-all-and-end-all D200. “The checklist” that promised to give you a step-by-step explanation of every move you would make, from initial handshake to final handoff. In 2001, the thirteenth edition of the AHPP was issued. And it was a new world. For the US, and for architects. The contents were reduced to a single bound book. With the AIA Documents sequestered to a CD-ROM. And for the first time, the edition was printed on the binding – henceforth resulting in readers referring to the AHPP by edition. The first 9 chapters were devoted to markets, marketing, financial operations and HR. But the AHPP no longer told us who we were – or who we could become. Not in our own right, anyway. But instead, we only existed so long as we had clients. No client, no architect. And while practically we understood this to be true from a business perspective, the architect was clearly no longer front and center. The off-center logo of the twelfth edition now had been shifted almost completely off the cover, so to speak. The architect – in the first 250 pages – was almost nowhere to be found. The center – had there ever truly been one – did not hold. Each architect had to discover and define who she was for herself. 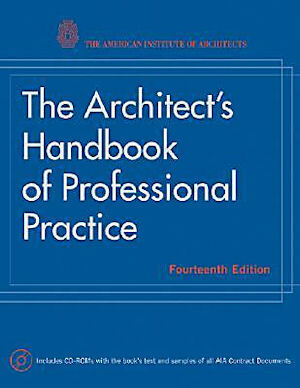 The fourteenth edition, printed in 2008, returned the architect to their rightful position in the AHPP. And so on. But by the time this last edition was delivered, the world’s economy was in disarray with architect , profession and industry scrambling for survival. The fourteenth edition, thick as a tombstone, was a memorial to what the architect had been. What would become of the architect was anyone’s guess. And while we suspect who the architect is – and will become – will have something to do with BIM, IPD, sustainability and digital fabrication, many architects would sooner be defined by their unique attributes, by their education or experience than by technological or global trends that reside outside themselves. I do not envy the task the esteemed architects and educators who are undertaking the next – the fifteenth edition – of the AHPP. There has never been a more important undertaking for our profession than the definition of who the architect is and needs to be in the immediate future. Here is how you can help bring about the new edition of the AHPP. Help shape its intent and content by taking a short survey. The deadline is coming up quick (Wednesday, August 31) so take a couple minutes right now to answer a couple questions here. What is your first memory of the AHPP? Has it been of use to you at any time in your career? If so, how? Please let me know by leaving a comment. You are on a roll with your newest posts. I do remember seeing those 4 binders you speak of. It must have been around noon one Friday- quitting time as our firm worked til 630pm all other days- and I was on my way to the library to study for the A.R.E. To help me with resource materials and study aids, one of my laid-back superiors, a Berkeley-grad, one of two PAs in the office besides the Principal, leaned back in his chair, stood up, and pointed to his bottom bookshelf, showing me what I, too, thought was pure gold: the 4 binders you mentioned above. This was back in 1992. I had graduated in 1987, and had worked continuously in various firms in Columbus, Ohio to Tustin, California. And yet, no professor, no firm, nor mentor, nor any publication had ever “informed” me of the existence of these books; and I hadn’t run across them on the bookshelves of the office libraries nor in the AIA bookstore guide Maybe I saw them and didn’t recognize what they were. Of course, it was up to me to manage my career- back then, I simply didn’t know what I didn’t know. Sometime around 1998 or so, I purchased the 1994 Student Edition of The Handbook of Professional Practice- which only contained volumes 1 and 2 (and none of the AIA documents). I always looked upon it as a reference guide that one could pick and choose which chapters related to his/her need at the moment. I never imagined taking time to read it from cover to cover like you’ve done. That’s impressive. Now that you’ve said that, I will certainly consider reading the latest version cover to cover. I agree with you, the 13th edition- being hardbound and not looseleaf, is daunting to behold. In reading pages xvii-xix, the “Introduction: Practice in Transition” by Robin M. Ellerthorpe, FAIA, Steering Committee Chairman, Contributing Author and Writer of the Preface. it looks like a very well-thoughtout- just not as user-friendly perhaps (?) in its packaging. I will spend more time reading it as the words are friendly and timely- even now. I’d also like to mention that the 13th edition has a chart on p. xvii that’s titled: “Redefinition of the Profession: From Product-Based Practice to Knowledge- and Service-Based Practice.” The author goes on to discuss the furtherance of PIA’s (Professional Interest Areas) and basically gives a concise historical overview of the progression of U.S. architectural practice from the 1960s to 2001. The foreword by Norman L. Koonce, FAIA (former EVP/CEO of AIA at the time) is astoudingly accurate and- frankly- makes my blogs on AIA KnowledgeNet look like yesteryear’s news. What you wrote certainly resonates with me. In many ways, what you have to say about the 13th edition of AHPP is a much fairer assessment than what I had to say. I love the fact that you returned to the student edition – despite having access to other editions of AHPP. I sometimes talk about our emotional attachments to books – I definitely have a soft spot for the 12th ed binders – and you perhaps for the student edition, post-it notes and all. I had been wondering the same thing. I started looking through the thread yesterday and got a few pages in…then decided that it would take too long to sift through to find out. But I don’t recall seeing anyone mention it. In Lee Calisiti’s blog (Think|Architect) tonight, he was talking about how, being architects, we are visual learners. Applying that obvious point to this humongous book, I wonder if the committee would be able to incorporate more 3D diagrams and images to help one master the concepts. Not that their task isn’t monumental in the first place. I’m going to go mention this book on that thread- for posterity sake. It may help someone- like me- who hadn’t heard about it during school.